Lumenus tells a story of how seperate pieces can collaborate to create synergy. Initially created by a group of Industrial Design and Built Environment students of Eindhoven University of Technology, this installation fuses both disciplines into a parametric design with integrated lighting and interaction. This proposes a glimpse into the future where integrated lighting will make more structures around us come to life. The structure is based on Buckminster Fuller’s ‘tensegrity’, which purpose is to create maximum aesthetic value with a minimum use of material. Inspired by the mechanics of biology, tensegrity balances tension and compression until it reaches structural balance. 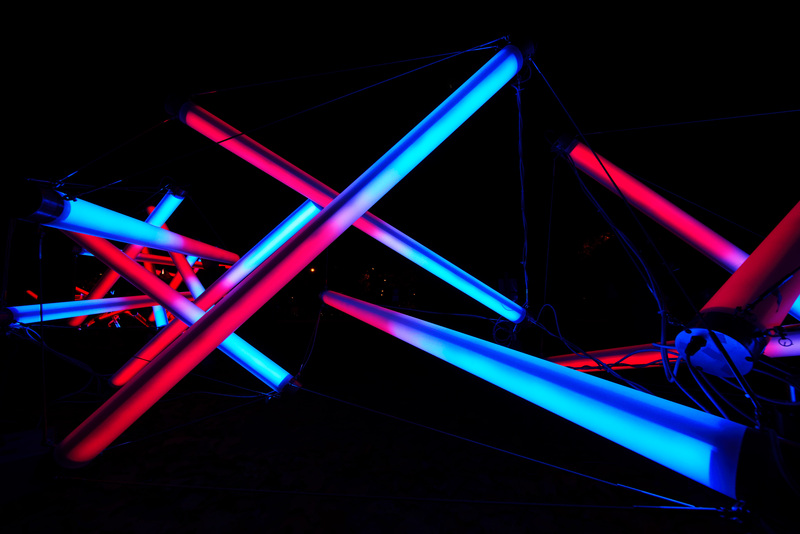 Combined with lighting, this results into a spacious sculpture with tubes that appear to be floating. The spacious and organic shape challenges audiences to explore and interact. Upon touch, the immense installation generates a visual response. Different actions generate different results, inviting the audience to play. This activates the installation and the space, leaving the people occupying it filled with wonder. This artwork is poperty of and designed at the Technical University of Eindhoven. Timo Lejeune and Julius Oosting both graduated at the Technical University of Eindhoven in Industrial Design respectively Built Environment. 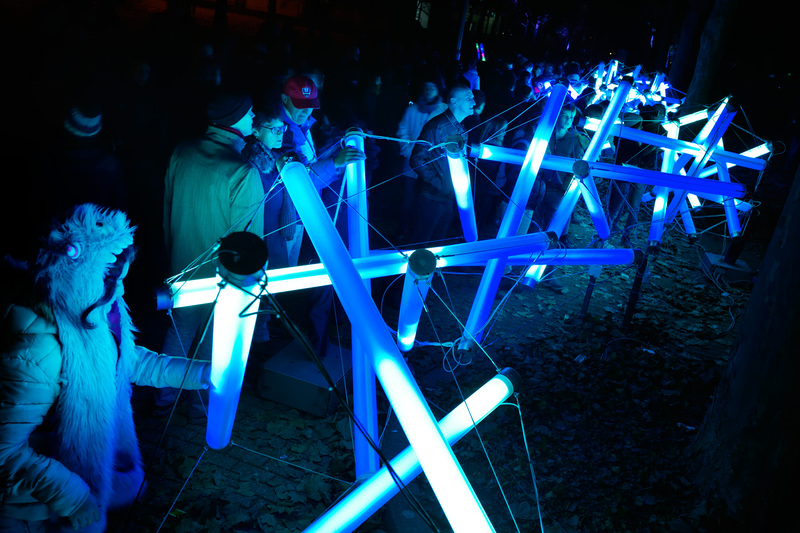 As key figures in the Lumenus project they have continued to maintain and exhibit the artwork after its debut at Glow Eindhoven. Currently they are primarily active at music festivals as Lumus Instruments, developing creative lighting that merge design, architecture and technology. Lumenus was exhibited at GLOW Eindhoven (2016), Lowlands Festival (2016), Into the Woods Festival (2016), Into the Woods ADE(2016) and Wildeburg Festival (2018).